INDICATIONS: A fine enriching cream for daily maintenance of skin, and to aid in nature’s natural healing process. DESCRIPTION: Gordon’s Vite A Creme is prepared with the extra–strength Vitamin A formula of 100,000 IU/oz. in a rich base of quality emollients. This lightly scented, water soluble, non-greasy, white cream is ideal for general skin care, as well as for geriatric and diabetic skin, and dry foot conditions. It is helpful in the treatment of fissures, chafed skin, and sensitive or irritated skin. It is also useful for nursing home or bedridden patients. Vitamin A offers the cosmetic advantages of increasing the skin’s elasticity and softness, and rendering useful treatment of such seasonal problems as dryness, sun and wind burn because of its normalizing properties. Vitamin A can increase the amount of protein and thickness of the skin surface, thereby fortifying and improving the skin’s condition. The use of vitamins, such as Vitamin A, on the skin can aid in preventing, retarding, or arresting certain degenerative changes associated with the aging process, such as dry and scaly skin and the formation of wrinkles. 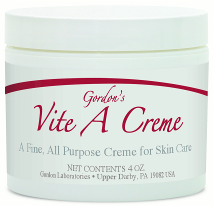 Because natural Vitamin A is used in Gordon’s Vite A Creme, it can maintain soft and smooth skin by replenishing nature’s moisture. PHARMACOLOGY: Topically applied vitamins play a useful role in combating various skin disorders. Orally ingested vitamins are not always transported to the skin in sufficient quantities because of poor absorption, improper functioning of metabolic systems and aging. Thus, the topical application of vitamins can provide the skin with local vitamin concentrations higher than those attained by oral ingestion.